آب نقش مهمی در فراوری کانی‌ها دارد و تقریباً برای فراوری یک تن ماده معدنی 2 تا 3 تن آب مصرف می‌شود. بخش عمده عملیات بازیابی آب در تیکنرها انجام می‌شود. در تحقیق حاضر، به‌منظور مهار باطله تر خروجی از کارخانه هماتیت گل گهر، در حالات مختلف خوراک دهی، میزان مناسب مصرف فلوکولانت با اهمیت دادن به شفافیت آب سرریز و صرفه‌جویی در مصرف آب کارخانه تعیین شد. آزمایش‌های ته‌نشینی با تغییر نوع فلوکولانت مورد استفاده (A25, A26 Yazd, A26 Esfahan, A27, A28)، میزان مصرف فلوکولانت (20، 25، 30، 35 و 40 گرم بر تن) و درصد جامد خوراک ورودی تیکنر (5، 7، 9، 10 و 11 درصد) انجام شد. با توجه به دخالت سه عامل ذکر شده در پنج سطح مختلف، طرحL25 تاگوچی برای انجام آزمایش‌ها انتخاب شد.نتایج به‌دست آمده از آنالیز واریانس با در نظر گرفتن قابلیت اعتماد 95 درصد نشان داد که نوع فلوکولانت و درصد جامد خوراک ورودی تأثیر قابل ملاحظه‌ای بر شفافیت آب ندارد، اما مقدار مصرف فلوکولانت به‌طور چشمگیری شفافیت آب را تغییر می‌دهد) 006/0=p-value). همچنین مشخص شد که استفاده از فلوکولانتA26 با میزان 40 گرم بر تن، شفافیت بهینه آب را در پی خواهد داشت. با اجرای نتایج این تحقیق در کارخانه مورد مطالعه، میانگین مصرف آب به ازای هر تن ماده ورودی از 86/0 متر مکعب به 49/0 مترمکعب کاهش و در نتیجه درصد رسوبات کف واحد تغلیظ کننده از 7 درصد به 45 درصد افزایش یافت. Water plays a vital role in mineral processing as evidenced by the approximately 2 to 3 tons of water used for the treatment of one ton of ore. A major portion of this water may be recovered in thickeners. This study aimed to control the wet tailings output of the Hematite Gol-e-Gohar plant by changing flocculant dosage and type and solid percentage in the feed in order to enhance effluent clarity and reduce water consumption. Materials and A series of settling experiments were performed using different combinations of the flocculants (A25, A26 Yazd, A26 Esfahan, A27, and A28), flocculant doses (20, 25, 30, 35, and 40 gr/ton), and solid loads in the feed (5, 7, 9, 10, and 11%) to the thickener. The L25 Taguchi design method was chosen to handle the five different levels of the three factors. Adopting a 95% confidence interval, the results of analysis of variance (ANOVA) revealed that flocculant consumption rate had a high effect on settling velocity (p = 0.006) while flocculant type and solid percentage in the feed had no significant effects. Moreover, it was found that A26 (Akhtar-chemistry Company, Yazd) used at a rate of 40 g/ton improved the settling performance to yield an optimal water clarity. Using the findings of this study in process planning at the plant led to a considerable reduction (from the original 0.86 to 0.49 m3) in average water consumption per ton of input material so that the solid content of the thickener underflow rose from 7 to 45%. 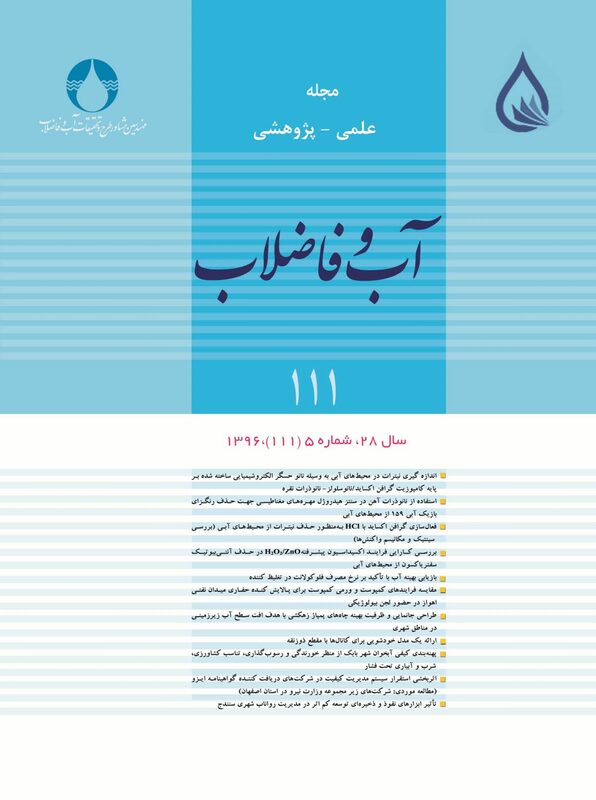 Behrouzi, K., Vafaei Fard, M., Raeiszadeh, A. & Faeghinia, A., 2011, "Water recycling at processing plants in water scarce regions- a case study of thickener design for the Mansour Abad processing plant", Proceeding Tailings and Mine Waste, Vancouver, BC. Daniel, E. & Walsh, P.D. R., 1988, "A study of factors suspectedof influencing the settling velocity of fine gold particles", Mineral Industry Research Laboratory, Fairbanks, Alaska. 99775-1180, Library of Congress Catalog Card Number 88-060573, ISBN 0-91 1043-05-5, MlRL REPORT NO. 76, January. Eswaraiah, C., Biswal, S.K. & Mishra, B.K., 2012, "Settling characteristics of ultrafine iron ore slimes", International Journal of Minerals, Metallurgy and Materials, 19 (2), 95-100. DOI: 10.1007/s12613-012-0521-6. Garmsiri, M.R. & Shirazi, H. A., 2012, "A new approach to define batch settling curves for analyzing the sedimentation characteristics", Journal of Mining and Environment, 3(2), 103-111. Gladman, B.J., Usher, S.P. & Scales P.J., 2006, "Understanding the thickening process", Dept. of Chemical and Biomolecular Engineering, The University of Melbourne, Australia, Australian Centre for Geomechanics, Perth, ISBN_0-9756756-5-6. Maurice, C., Fuerstenau, N.H. & Kenneth, N., 2003, Principles of mineral processing handbook, Society for Mining, Metallurgy and Exploration, SME, Colorado, p. 340. Parsapour, Gh. A., Arghavani, E., Mosavi S. M. & Banisi, S., 2014, "Designing the feedwell of the Gol-E-Gohar iron ore company thickener", International Journal of Current Life Sciences, 4 (2), 684-687. Parsapour, Gh.A., Hossininasab, M., Yahyaei, M. & Banisi, S., 2014, "Effect of settling test procedure on sizing thickeners", Separation and Purification Technology, 122, 87-95. Rudman, M., Paterson, D.A. & Simic, K., 2010, "Efficiency of raking in gravity thickeners", International Journal of Mineral Processing, 95, 30-39. September, N. & Kirkwood, R., 2010, "Clermont coal mine project selection of tailings paste thickener", AusIMM-Technical Meeting, Rio Tinto, p. 10. Tchobanoglous, G. & Burton, F. L., 1991, Wastewater engineering: Disposal and reuse, 3rd Ed., Metcalf & Eddy, McGraw-Hill Inc., New York, N.Y.
Unesi, M., Noaparast, M., Shafaei, S. Z. & Jorjani, E., 2014, "Modeling the effects of ore properties on water recovery in the thickening process", International Journal of Minerals, Metallurgy and Materials, 21 (9), 851-861. Unesi, M., Noaparast, M., Shafaei, S.Z. & Jorjani, E., 2014, "The role of ore properties in thickening process", Physicochem. Probl. Miner. Process, 50(2), 783-794. Vietti, A.J. & Dunn, F., 2014, "A description of the sedimentation process during dynamic thickener operation", Australian Centre for Geomechanics, Perth, ISBN: 978-0-98709. Vietti, A.J., Boshoff, J.C.J. & Cope, A., 2010, "Does thickening save water? ", The 4th International Platinum Conference, Platinum in transition ‘Boom or Bust’, The Southern African Institute of Mining and Metallurgy. Weston, V., 2013, "The application of mathematics, physics, chemistry and engineering to evaluate solutions in process, environmental, and mineral applications for separating suspended matter and soluble constituents from an aqueous phase", Salt Lake Community College. Science, Math and Engineering Symposium, April 23. Wills, B. A. & Hopkins, D. W., 2006, Mineral processing technology, 7th Ed., Amazon.